Maybe you've wished you could control your DVR or cable box through your entertainment cabinet doors. Or, maybe your spouse always forgets to turn off the TV and you wish you could flip off the TV from the other room without getting up. NOW YOU CAN DO IT ALL! We believe everyone deserves more power from their remote controls. With the Remote Control Extender, you will have all the power you need and more! 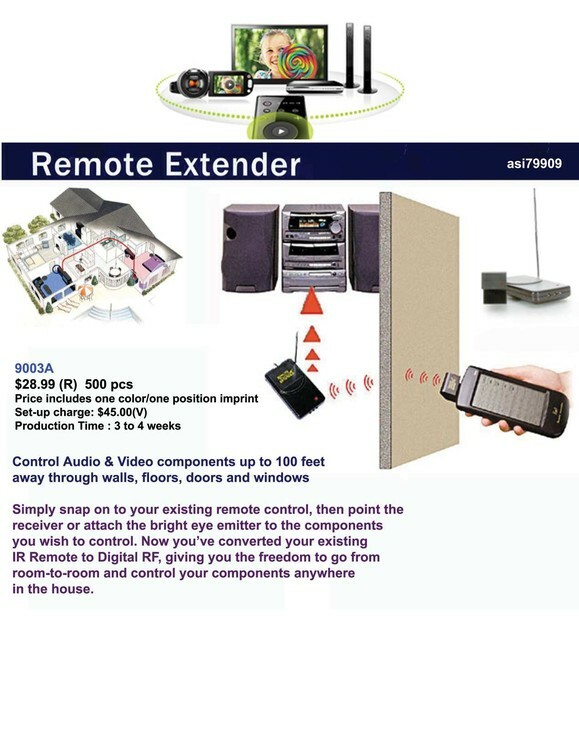 Not only does the Remote Control Extender extend the strength and range of your remotes up to 100 feet, but it allows them to send the signal right through walls, floors, doors, cabinets and more! This technology is simply amazing! Now you can hide away your bedroom DVD player, instead of balancing it on top of your TV or dresser. Just put it away in a drawer or stash it behind your TV and control it with ease! Stash away your living room cable box or TiVo. Keep your entertainment cabinet doors closed at all times! Keep your living room looking sleek and uncluttered! The Remote Control Extender works with any infrared (IR) remote - that means your TV remote, cable box remote, Universal Remote and more! Give your living room and bedroom that modern clean and tidy look. Stash away all your components and retain remote control! VERY SIMPLE! And, it's easy to set up too - simply place the transmitter in another room and set the receiver in the room with the item you want to control. All you have to do is plug them in and you're done! The Transmitter receives the IR signals from your remote control and converts them into a radio frequency signal. This signal penetrates walls and is picked up by the Receiver. The Receiver then converts the signal back into an IR signal and sends the command to the equipment being controlled. It all happens instantaneously! © 1998-2019 Promotek and iBank®. All Rights Reserved.